The builder did not accept our offer but did counter and now we have gone back and forth 3 times! It is now down to a difference of $2500 and it's in their hands. Last night we submitted our final offer but they don't seem like they are willing to budge. I am waiting patiently to hear back but I have a feeling that it will not be in our favor. 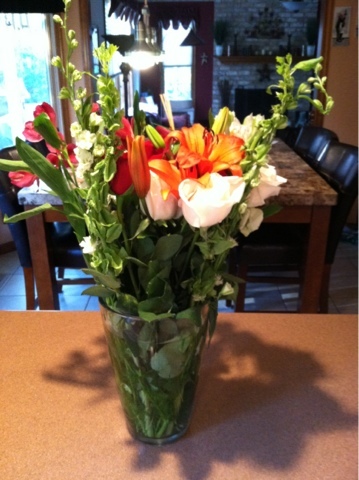 I came home from work yesterday to a beautiful bouquet of flowers..."just because"....made my day!! Short has a half day today and is going home to a friends house and then he has off tomorrow and Monday. Grande and Tall come home tomorrow. They told us yesterday that we could work tomorrow 8:15am-12pm and still get paid for the full day! I am so excited because I still have to get all my Easter basket goodies for the boys!! Just because is the best reason! Lovely flowers, and good news on the pay! Have a lovely Easter!